Tomorrow is Bhogi - the first festival of the new year in the English calendar , and also one of the the main festivals for farmers - the backbone of Indian economy. While bullock carts may have been replaced by motorised tractors & two wheelers by SUVs, the Indian farmer still grows most of the produce that we eat today. Festivals like these were devised to worship and thank nature for its bounty and also worship wholesome meals in their natural form.Like a Guru when asked in a discourse about the adulteration of food, said " Eat what comes wrapped in a natural wrapper (like whole grains & fruits & vegetables) and discard anything cooked & wrapped in paper, more so plastic." So simple and easy to follow, isnt it ? We have wholewheat noodles with no-added MSG, and we feel we are feeding ourselves and our kids healthy food-how ironic can it get ? Traditionally, in South India rice is harvested during Pongal, and therefore different varieties of rice based dishes – Ven Pongal , Khara Pongal, Chakkarai Pongal, Thirukanamudhu etc were part of the menu for the 4-day long festival along with Avial & Medhu Vadai. 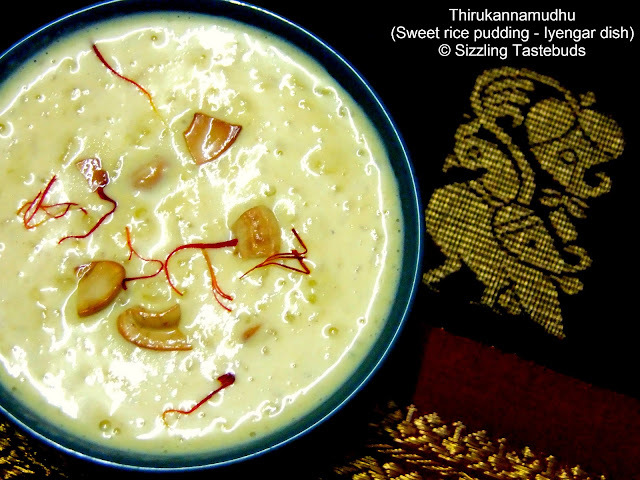 Today, I have presented a classic Iyengar sweet kheer called Thirukannamudhu made of cooked rice. Wish you all a very happy Pongal and a prosperous new year ahead ! This is generally prepared with freshly harvested short grained rice. To get a rich and full texture, fry the rice in a tsp of ghee before cooking and also use half milk and half water to get a gooey rich rice pudding .. This was one of my Paati’s (grandmom’s) signature dishes, and am sooo happy to present it here today.. According to Wikipedia “Sankranti is the Sanskrit word in Indian Astrology which refers to the transmigration of the Sun from one Rāshi (sign of the zodiac) to another. Hence there are 12 such sankrantis in all. However, the Sankranti festival usually refers to Makara Sankaranti, or the transition of the Sun from Dhanu rashi (Sagittarius) to Makara rashi (Capricorn). Sankranti is celebrated all over South Asia with some regional variations. It is known by different names and celebrated with different customs in different parts of the country - In India it is known by different regional names : Makar Sankranti or Sankranti,Uttarayan, Maghi ,Pongal , Magh Bihu or Bhogali Bihu ,Shishur Saenkraat & Makara Vilakku Festival .For this purpose, the signs and houses of the zodiac are calculated using sidereal time, not tropical. As such it does not account for the Earth's precession. The festival therefore takes place around 21 days after the winter solstice (between December 20 and 23) that marks the starting of the phenomenon of 'northward apparent migration of the sun' or Uttarayana, literally meaning northward journey of Sun. Considering that winter solstice marks the beginning of the gradual increase of the duration of the day,the shortest day of the year is around December 21–22 after which the days begin to get longer.Hence actual Winter Solstice begins on December 21 or December 22 when the tropical sun enters Makara rashi. Hence actual Uttarayana is December 21. While the traditional Indian Calendar is based on lunar positions, Sankranti is a solar event. So while dates of all Hindu festivals keep changing as per the Gregorian calendar, the date of Makar Sankranti remains constant over a long term, 14 January. Makar Sankranti is celebrated in the Hindu Calendar month of Magha." Happy to send this over to - Radhika’s Let’s Cook – Rice , Gayathri’s Walk through Memory Lane. 2) In a non stick pan, boil milk, add saffron strands for about 10 mins till it starts to form a cream on the top. Now add the cooked rice and mix well. After 10 mins, the rice will coagulate with the milk. 3) Cool slightly and add the sugar syrup, elaichi powder and the ghee. Keep on the stove again and boil on very low heat or further 5 – 8 mins till you get a wonderful sweet aroma. 5) Delicious Thirukannamudhu is ready for naivedyam (offering to God). Absolutely awesome treat .. adding edible camphor has become an outdated one.. but love its aroma n flavors.. very yummy dish..authentic dish.. we make paal poli for bhogi.. Traditional dessert well made. Happy Pongal wishes to U Kalyani. 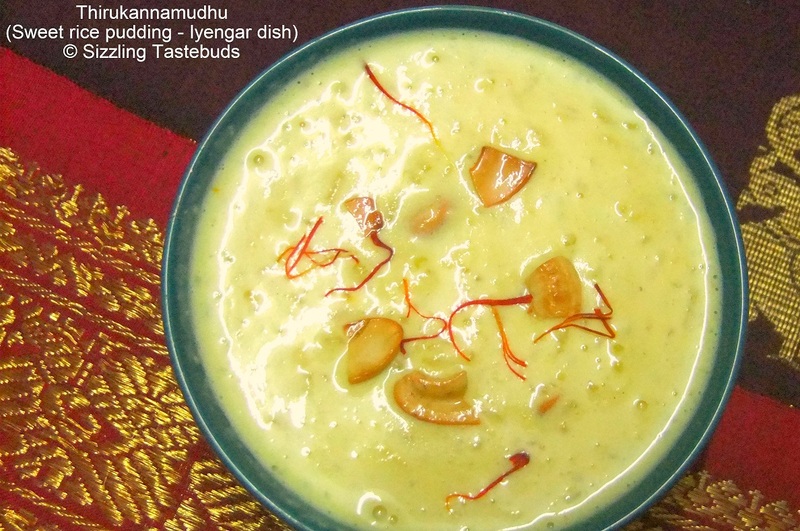 Happy Pongal to you.......Kheer looks perfcet for the occasion. Yum yum,great looking dish, prefect for this festive days. aim gonna try this one for bingo...looks awesome...you have changed your blog quite a bit...looking nice...hopefully I will get back to active blogging soon..
Pongal nalvzhtukkal! :) Lovely payasam! 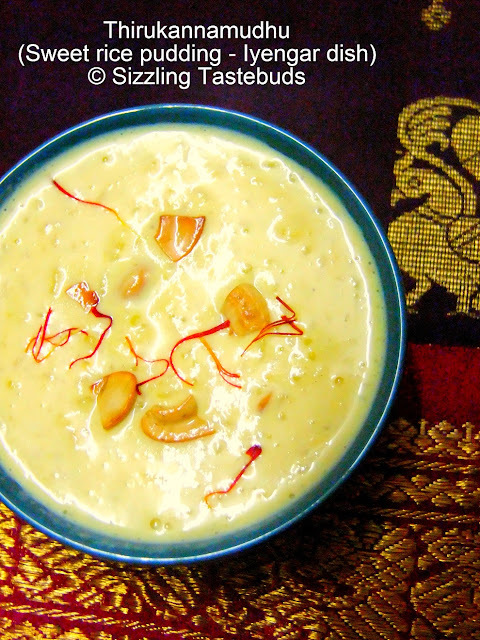 very creamy.delicious and perfectly done kheer!!! This is one of my favorite dishes, which my neighbor (Iyengar Mami) used to prepare with so much authenticity. A Very Happy Pongal to you. Lovely click. Looks absolutely inviting. Thanks a lot for linking..
great pics - looks so yummy! am a new follower.. do drop by when you get the chance..